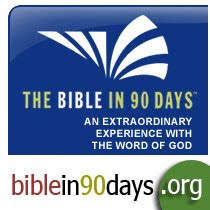 Yesterday was day 90 in my journey to read the Bible in 90 days. When I started, I was scared of failure. I'm not the best person at sticking to things, so I wasn't really sure if I could do it. But, I thought with the inspiration of some really great ladies, who had signed up for the challenge, maybe I could. The first month, I did really good. I only got behind a day or two at a time. So, it wasn't hard to catch up. However in the last month or so, I had some really busy, hard days, and ended up getting behind by about 10 days! I thought there was no way I could catch up. I tried not to stress myself too much, and decided even if I didn't finish in 90 days, it would be okay, as long as I did finish. Somewhere during that time, I thought I should try to catch up a little at time. Amazingly, I ended up caught up again about a week ago! I don't know how I did it, but I thank the Lord for helping me! I actually finished reading the Bible a few days before our challenge was up! I have a lot of questions and things I hi-lighted in my Bible that I am going to go back and look into more in-depth. I learned so much, and yet I know I have so much more to learn! I would like to thank Mom's Toolbox for sponsoring this challenge! Without you I never would have tried! If you would like to take the challenge, Mom's Toolbox is sponsoring another read the Bible in 90 days, starting on July 5th! Wow! Good for you. That's quite an accomplishment. I have to say I had thought about doing it along with you all but didn't get started. Wish now I would have! Great job! That's something to be very proud of Nancy! Awesome! I got behind a few times too - but I'm so glad I caught up and completed it. Amazing Nancy! Good for you. I hope you and your family have a nice Easter. WoW! I am so happy for you!! That is an awesome accomplishment! I am sure you will be truly blessed from it! Maybe I need to join in July ... I've been reading thru the Bible in like 3 years!!!! LOL SLOW going for me. That is awesome! You are an inspiration! I really need to read the Bible, or at least study it more.